As I am putting the final touches on our homeschool planning for the next academic year (starts in June, ends in May 2013), I was fortunate to come across a little gem of an eBook. I have long been a fan of Jimmie, of Notebooking Fairy fame. I enjoy all that she continually contributes to the homeschooling community. Her blogs and ebooks are an indispensable resource to home educators, especially this one! I am not sure why I had not discovered this eBook until now, head-in-the-cloud syndrome?, but I was blessed in pouring over it during the waning hours of my curriculum development for the upcoming semester. 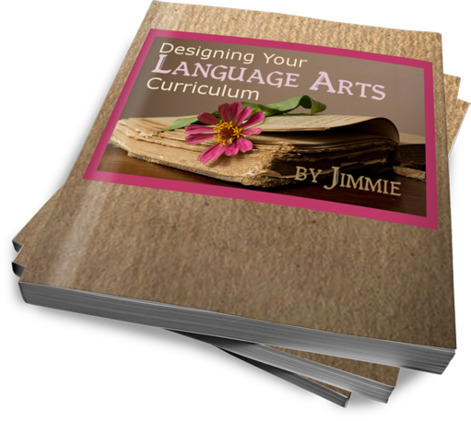 The eBook publication is entitled Designing Your Own Language Arts Curriculum and it is written and published by Jimmie. The eBook retails at $3.00 each and can be purchased directly on Jimmie's blog. Designing Your Own Language Arts Curriculum is a resource for home educators that enables them to create a full Language Arts program to best suit their student and teaching style. The book covers a wide variety of topics that will help the home educator prepare a complete curriculum that is especially tailored for their student. Jimmie's extensive background in Language Arts and home education has enabled her to speak candidly about the many methods and styles used in teaching this subject. She is able to instruct clearly on everything from Shakespeare, all the way to counseling your student through editing their own writing. She speaks about each subject within Language Arts with poise and confidence, with an experience that reassures that you can adequately teach Language Arts at home. (A true concern to every home educator's heart). As the child of an amazing Language Arts teacher, who possesses over 25 + years of tried and true experience in this field (Hi Mom! ), it is safe to say I am prone to being overly critical on this topic. That being said, I thoroughly enjoyed this eBook and the vast amounts of resources that it offered me as a home educator. Home educators ,with both veteran and newbie experience, would equally benefit from reading this book. Jimmie's "nonsense" approach and practical methodology help you to become comfortable and confident in approaching Language Arts with your own student. The eBook itself contains countless links to printables, downloads, articles and additional posts that make it well worth the purchase. This little gem of an eBook can be purchased for instant download for just $3.00. You can purchase a copy of this lovely little eBook at HERE. This eBook is economically priced and well worth the time it takes to read. I highly recommend this purchase to help you prepare for another year of homeschooling adventures. Jimmie has graciously provided a copy of her eBook: Designing Your Own Language Art Curriculum for me to giveaway to one of my deserving readers. Just in time for all of your Homeschool planning and organizing! MANDATORY ENTRY: Leave a comment below listing your FAVORITE Language Arts curriculum or resource. More Ways to Win: Leave an additional comment for each entry. If the winner has already purchased this eBook, Jimmie will refund your purchase. Winner will be announced on May 20th, 2012 on our blog. Winner(s) will be contacted via email with 48 hours of winning announcement. If the prize winner forfeits or does not claim the aforementioned prize, the prize will be awarded at the owner's discretion. Void if prohibited by the law in your area. Giveaway is open to residents living in the continental US only. Happy Homeschool Planning and Organizing to all! Disclosure: This eBook was purchased for my own personal use, and I shared it with my reader's as a helpful resource. I did purchase this book. The publisher of this book has furnished a copy for giveaway on this blog. I was not compensated in anyway for this post. Weekly Homeschool Planner - The best Homeschool Planner! Made for Home Educators by a Home Educator. Notebooking Fairy - Notebooking resources galore! Start your notebooking adventure today. My favorite language resource is our grammar text, Easy Grammar. My children are excelling at grammar, thanks to these books!